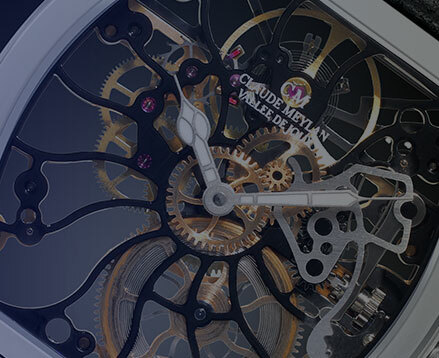 CLAUDE MEYLAN takes its inspiration from the great tradition of cases shapes and creates « Tortue de Joux » in the LAC line. With its pure and timeless curves associated with a proven mechanical, “Tortue de Joux” introduces a new sculpture of time. In the middle of the piece of work, dressed with rhodium, the hour and minutes wheels carry the hands into an infinite ballet. The shape of the banners so often reproduced on our watch farms shutters inspires the décor. The transparencies, such as sunbeams, plays with the contrasts of the matching colours in the bridges and bottom plates. Each hole is recessed, completely decorated and in a harmony of particular shapes ; the result is an intriguing transparency and light. The suspension of this kind of components takes us into a new dimension were you’ll have your own interpretation of the space-time. “Tortue de Joux” will allow you to evade and discover at your leisure, the key components of its fascinating mechanical through its subtle and elegant shapes.